Boigu Island () (also known as Malu Kiyay or Malu Kiwai ) is the most northerly inhabited island of Queensland and of Australia. It is part of the top-western group of the Torres Strait Islands, which lie in the Torres Strait separating Cape York Peninsula from the island of New Guinea. The mainland of Papua New Guinea is only 6 kilometres (3.7 mi) away from Boigu. Boigu has an area of 89.6 km². It is the largest and only inhabited island of the Talbot Islands group of the Torres Strait Islands. 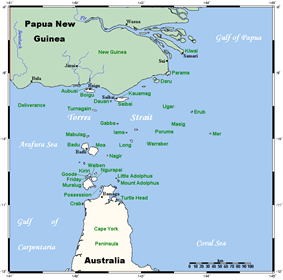 The language of Boigu is that of the Western and Central Islands of the Torres Strait. The specific dialect is Kalau Kawau Ya, also spoken on the islands of Dauan and Saibai. The people of the three islands consider themselves as one people. Boigu was visited by South Sea Islander missionaries of the London Missionary Society, some time after the establishment of a mission on nearby Saibai Island in 1871. From the 1870s to around 1910, the Boigu, Dauan and Saibai people, along with the neighbouring Papuan peoples, were being harassed by thugeral "warriors" from the Marind-anim, fierce headhunters from what is now southeast West Papua. In literatie dealing with the period, these people are generally termed 'Tuger' or 'Tugeri'. Sir William MacGregor, the Lieutenant-Governor of British New Guinea, noted in 1886 that the population was nearly extinct as a result of these raids. What he did not realise was that at the time the bulk of the population were staying with family on Saibai and Dauan for mutual protection. Boigu is approximately 18 kilometres (11 mi) long, and low-lying. It was formed by the accumulation of alluvial sediments deposited by the discharge of nearby New Guinean rivers into the Strait. These sediments built up over time on an old coral platform which rises from the shallow continental shelf, eventually creating the island. Most of the island is subject to extensive periodic flooding, and as a result the community township has been built on the highest ground. Satellite image of Boigu Island. Two nearby smaller islands (not permanently settled) are considered as a part of Boigu island, more accurately of the Talbot Islands, these are Aubusi Island and Moimi Island. The island is considered part of the New Guinea mangroves ecoregion, a subset of the Australasia ecozone. The interior of the island is sparsely vegetated, and mainly swampland. The coast is fringed by mangroves, which act to protect against the island's sand and mud from sea erosion. It is likely the mangrove regions harbor healthy populations of saltwater crocodile. The waters surrounding the island are an important habitat for dugongs, a species of sea mammal listed as vulnerable by the IUCN. Boigu is predominantly inhabited by indigenous Torres Strait Islanders. According to 2004 Torres Strait Regional Authority (TSRA) figures, its resident population is approximately 340. Currently there are approximately 260 people living on the island (2008). The village of Boigu at the northern end of the island is the northernmost settlement of Australia. The northernmost island, however, is Bramble Cay, 173 kilometres (107 mi) to the east.